Incisors are the four teeth located in the front of the upper and lower jaws, situated between the cuspids. We have a total of eight incisors. Generally, incisors have one root, while molars normally have two or three roots. The six teeth located at the front of the mouth in both the top (or maxillary) jaw and bottom (or mandibular) jaw that include the incisors and cuspids are collectively referred to as the anterior teeth. Teeth located at the back of the jaw are referred to as posterior teeth. Central incisors are those in the very front and center of the jaw, known as the mesial position. The largest incisors are the maxillary central (top and center) incisors. They are the most prominent teeth visible when a person smiles. Lateral incisors are the two teeth located to the right and left sides of the central incisors. They are also referred to as being in the distal position, or away from the center of the jaw. Incisors are the first teeth to appear in babies, and the first adult teeth to erupt. The first two front teeth, known as central incisors, appear in babies as deciduous teeth—also known as baby teeth—between eight and twelve months of age. These are replaced sometime between the age of six and seven with permanent teeth. Lateral incisors are found next to the central incisors. Permanent lateral incisors appear around the age of seven or eight. The incisors primary function is to cut and tear into food (the name comes from the Latin word incidere meaning "to cut"), although the aesthetic appearance of these anterior teeth is highly scrutinized as they are visible during smiling, eating and talking. In a normal bite or occlusion, each maxillary incisor will slightly overlap the corresponding mandibular incisor beneath. 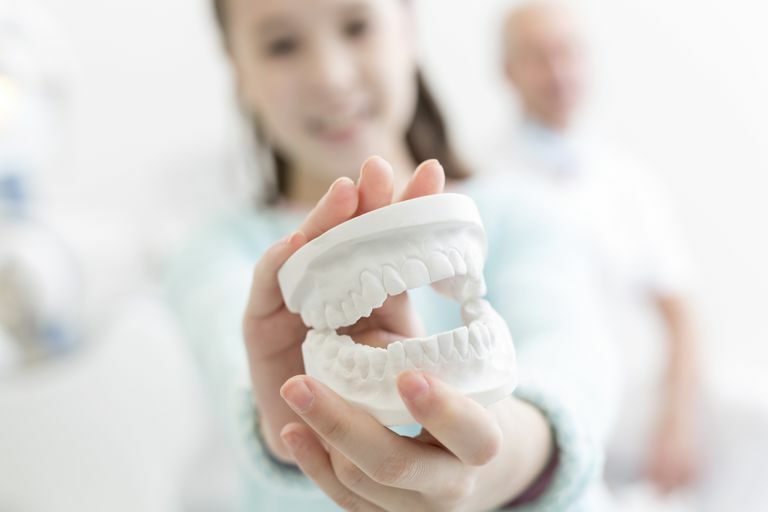 However, crooked teeth or a misaligned jaw can impact the bite. This common condition is called malocclusion, which can result in an underbite, overbite or crossbite. Crooked incisors and malocclusion can be addressed through orthodontics in severe cases, or with veneers in less severe cases. Orthodontics in the form of dental braces is commonly used to correct the malocclusion. As with all teeth, good dental hygiene is important to maintaining healthy incisors. Because they are located in the front of the jaw and most visible, they also have cosmetic and lifestyle importance. To protect and maintain your incisors, brush your teeth at least at least twice a day. Brushing after every meal is optimal—but wait at least 30 minutes after eating to brush to allow your enamel to reharden (enamel can become soft while eating and worn away by brushing too soon). Flossing at least once a day will help to control bacteria and plaque that hides between teeth where the toothbrush cannot reach. Bacteria in plaque can cause tooth decay and contribute to gum disease. Plaque that remains too long on teeth can become tartar, which must be removed by a dentist. Routine visits to the dentist for professional cleaning and polishing will keep your incisors in good shape throughout your life.